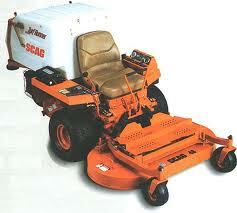 The Scag Turf Runner is a commercial-grade front deck zero-turn riding mower. Several features make the Turf Runner a versatile mid-size mower contender. The 48” front mount deck is constructed of 10-gauge steel. Power is gained from the 20 or 22 HP Kohler Command V-Twin engine. Unlike most zero-turn riding mowers, the Turf Runner is outfitted with an integral 7.14 bushel easy-dump grass bagger. With the same deck, you can conveniently switch from bagging to side discharge. A 12” blower cleanly blows grass clippings into the bagger. A padded high back seat and rubber shock mounted footplate improves operator comfort. The Scag Cougar is similar in some ways to the Turf Runner and different in others. The 48” front-mount cutting deck tilts up for easy cleaning, service, and blade sharpening. 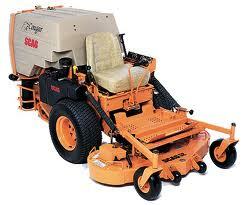 The mower is powered by a 25 HP Kohler Command engine. The Cougar had either a 10 bushel grass collection hopper, or with a tray for transporting lawn and landscape supplies. The cutting deck is easily changeable for side discharge, bagging or mulching. Mowing time is extended with dual 3.75 gallon fuel tanks. ScagOEMParts.com has replacement blades and many other parts to maintain and service your Scag Cougar or Turf Runner.